“In truth the creative spontaneity of our strike was the outcome of a dissatisfaction many of us have had with the typical antiwar rally. Usually people are urged to gather so that they can then listen to a number of big name speakers tell them at length about the issues. Speakers typically dwell on abstract problems and political issues that are not concretely connected to the everyday lives of those listening. Sometimes the speakers dwell entirely on the problem, offering few solutions other than signing a postcard or giving money to the organization that put the rally together. People come and leave, and they are not left with a sense of participation that amounts to much more than having been a body in a crowd that will invariably be undercounted by the corporate media, if it is reported on at all…. You can find Darwin’s piece in full at his blog, Sung a lot of Songs, here. 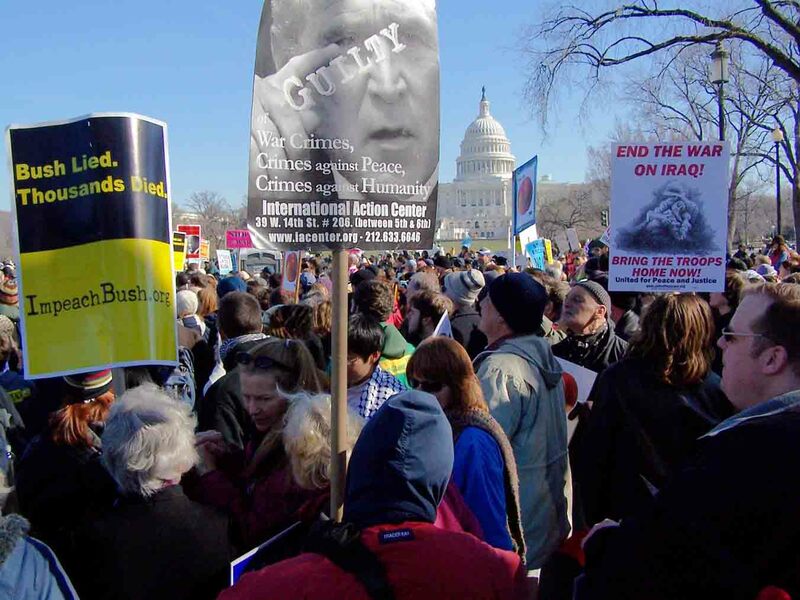 On January 27, what was by any estimation an enormous number of people gathered at the U.S. Capitol to protest the continuing U.S. war and occupation in Iraq. Despite the diverse geographic origins and political persuasions represented in the huge crowd, the demand for a speedy end to the war and withdrawal of U.S. forces was clear. If nothing else, this enormous, unambiguous outpouring of anti-war opinion highlighted the distance between an increasingly angry and concerned populace and a professional political class largely in business-as-usual mode, with most still maneuvering to extract every possible advantage from the vicious bloodletting taking place on the other side of the world. As I have written previously, I believe that too great a share of resources go into large, mediagenic events and to conventional efforts to pressure centers of government directly, at the expense of the sustained local and regional organizing and institution building essential to the kind of social change we will need to reign in the U.S. empire and the runaway global corporate capitalism that it sustains and dominates (see, e.g. Scale, Locale, and Demonstrations. Further reflections on this point and others regarding the state of the anti-war/peace movement follow in the latter part of this piece). But there are times when it is essential to muster as much “people power” as possible to just say NO, and this was one. It was such a moment not only because of the ongoing horror in Iraq, but because of the threat that the American juggernaut may roll on to Iran, unleashing consequences that only those utterly ignorant of history could claim to predict. From January 22 to January 26, 2007, three individuals with the Ground Zero Center - Brian Watson, CarolAnn Barrows, and Shirley Morrison - were on trial in a local court in Port Orchard, Washington, for their anti-Trident direct actions in May and August of 2006. They were charged with the misdemeanor of obstructing traffic into the Trident nuclear submarine base at Bangor, Washington, “without lawful authority.” Unusually, the judge allowed David Hall, former national president of Physicians for Social Responsibility, and me to offer expert testimony on January 24. The defendants also testified at length about the reasons for their actions. The jury, while sympathetic as revealed by post-trial comments, failed to seize the opportunity and instead convicted, as the Kitsap Sun reported. Another Kitsap Sun story described my testimony. It is somewhat garbled, but does convey the gist. I certainly did not say that international law allows use of nuclear weapons defensively! Nor did I indicate that citizens who fail to write letters in theory could be convicted of complicity! I did not get to all of it, and simplified quite a lot, but if you’re interested here’s the written outline of my testimony. Beyond the trial, the Ground Zero Center is doing a magnificent job of organizing, and participation and interest is on the rise. On January 15, 2007, Martin Luther King Day, 12 people were arrested at the submarine base, with over 200 there in total. In connection with the trial, they organized several events. I did a talk on “From Auschwitz to Trident” on January 20 at the Seattle Town Hall, with about 200 in attendance. You can see it on YouTube; the slides for the talk are here. I also was on Seattle’s National Public Radio affiliate KUOW on Jan 24, with a Center for Defense Information expert, Philip Coyle - here’s the audio. It was sobering for me personally, for all the time I spend on these issues, to think about the eight or nine Trident submarines based at Bangor. Based on Natural Resources Defense Council estimates in the Nuclear Notebook, November/December 2006 Bulletin of the Atomic Scientists, each carries 144 warheads, six per each of the 24 Trident II missiles on a submarine. The warheads mostly are 100 kiloton, about seven times the yield of the bomb with which the U.S. destroyed Hiroshima; some are around 450 kilotons, 30 times the Hiroshima bomb. About one-half of the subs are thought to be on patrol at a given time. The buildup of the more capable Trident II missiles in the Pacific clearly is aimed at exerting additional leverage on China, with the posture of readiness to actually wage nuclear war by striking enemy nuclear forces familiar from the Cold War era. For more on this, see the January-February 2007 Nuclear Notebook by Robert Norris and Hans Kristensen.